The Fashionable Fox is overly obsessed with tropical style-palm leaves, pineapples, flamingos, you name it! I love fun, colorful prints in the summer. 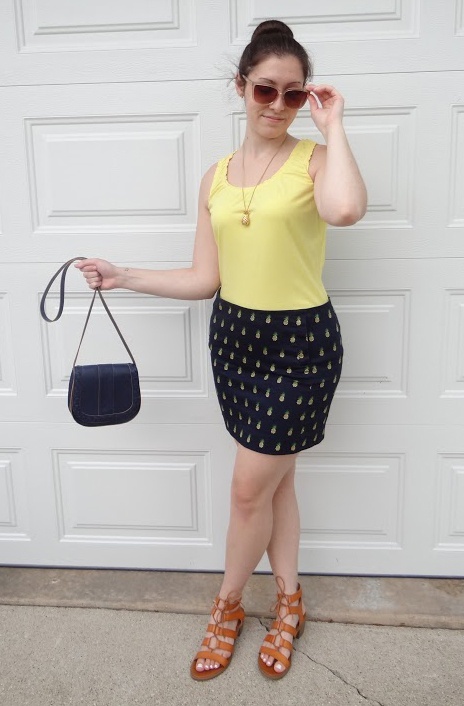 My latest find at Goodwill is this J.Crew pineapple skirt. The adorable print screams summer—it’s whimsy and fun, and the material is lightweight. For only $5.99, this skirt was the season’s steal! 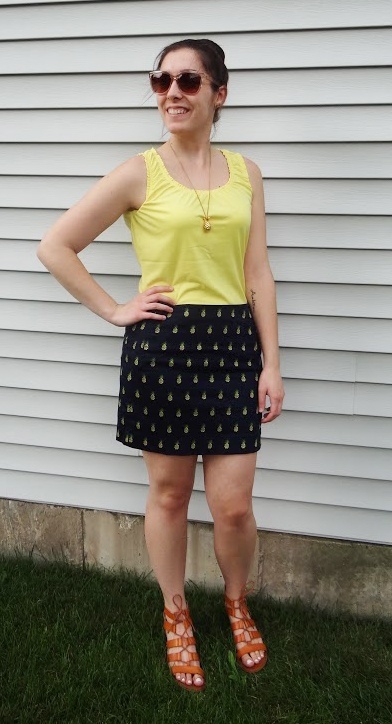 I paired the skirt with a simple Merona yellow tank, which was another Goodwill find for only $3.99. Staying simple on top is the best option, so nothing takes away from the cute skirt. Matching the top with colors in the bottom allows for this! For shoes, I chose these tan lace-up block heel sandals from Old Navy that I just can’t get enough of. Keep an eye out for other lace-up sandal styles hitting the scene now! A navy blue saddle crossbody bag from Old Navy is also a great addition to this outfit- especially at a Goodwill price of only $3.99. It matches the look and matches up to the other great deals! 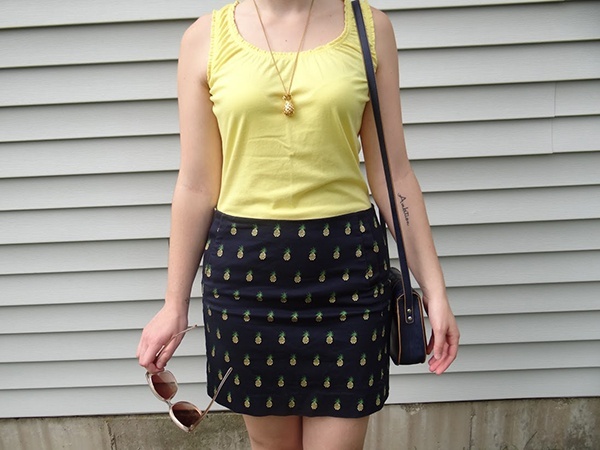 Finally, you cannot go wrong with a simple pineapple necklace and square shades for a sunny day. The necklace is a vintage find and the sunnies are a recent purchase from Kohls. 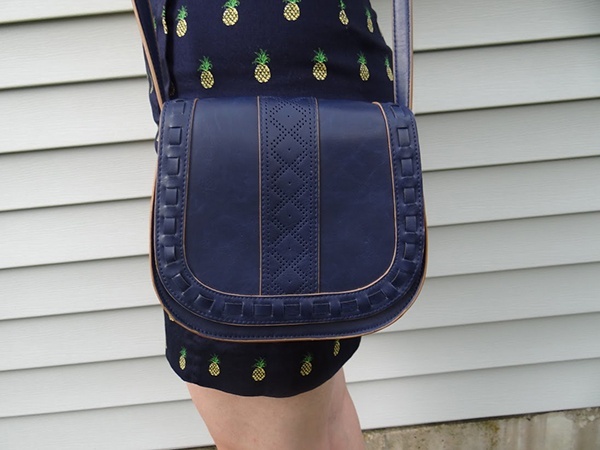 Incorporating fruit patterns into your outfit is very popular these days, but going with pineapples will really make an ordinary day feel like a tropical excursion. Top summer trends are all over the racks at your local Goodwill right now, so don’t miss out before the season comes to an end.